Mon., Jan. 1, 2018, 7:32 p.m. In the final game of one of his great career, Oklahoma’s Baker Mayfield threw for 287 yards and two touchdowns, and caught a touchdown pass that gave the Sooners a 17-point lead with 6 seconds left in the first half. The Bulldogs will play either Alabama or Clemson on Jan. 8 for the national championship in Atlanta, about 90 miles from their campus – with a chance to win their first national title since 1980. The first overtime Rose Bowl was also the highest scoring, surpassing last year’s 52-49 USC victory against Penn State. There was a lot more on the line in this one, which will go down as one of the greatest Granddaddies of Them All. After an offside penalty on Georgia gave Oklahoma a first down on third-and-five in the second OT possession, the Sooners stalled again and Austin Seibert came out for a 27-yard field goal. 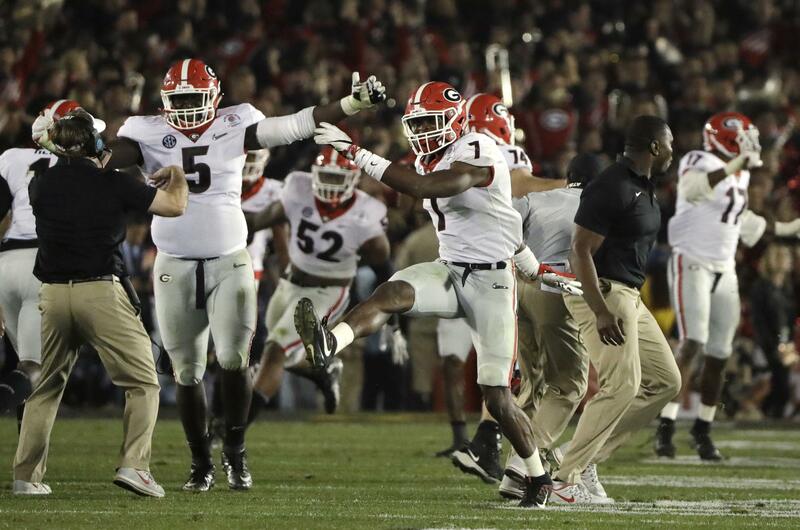 Leaping through the line, Lorenzo Carter got his outstretched hand on the kick and the ball fluttered down short of the uprights. Any score would have ended it for the Bulldogs, and on the second play Michel slipped one tackle and was home free. The Bulldogs sprinted off the sideline and toward the corner of the end zone to mob Michel. Confetti rained down. Meanwhile, Mayfield stood motionless on the sideline for several seconds, bent over with his hands on his knees and head down. Mayfield battled flu-like symptoms the week leading into the game, but he played just fine. “I can’t believe it’s over. It’s been a wild ride,” said Mayfield with a hoarse voice before he started to cry. Both teams settled for field goals in the first overtime, first Georgia’s Rodrigo Blankenship from 38 to make it 48-45. Then it was Mayfield’s turn. A touchdown would have sent the Sooners to Atlanta, but on a third-and-2 from the 17 Georgia All-America linebacker Roquan Smith tackled Jordan Smallwood a yard short of the first down. Published: Jan. 1, 2018, 7:32 p.m.